Thank you, Nik, for finding this free pattern by Annie Modesitt! I love it, and will put it on my project list for the Summer. I love the dropped shoulders and the sleeves. Beautiful! The following photos are ‘Inspiration Projects’, mainly for my friends and relatives that haven’t yet decided which top they want me to make for them. Well, it’s on to baby gift number two out of three. This little sweater is from one of my favorite baby pattern magazines, “Lanas Stop Bebes y Ninos” #70. This magazine is from Spain and has English instructions included. I’ve had my eye on this sweater for awhile. 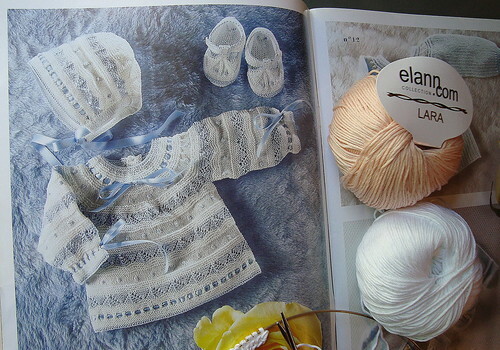 Instead of blue and white, I will be making this in pastel pink and white, and will use a cotton yarn instead of angora. I love the lace pattern stitch and the ribbon in this pattern. Only one size is given for this pattern: newborn. But with a size 3 needle and the cotton yarn I’m using, I am actually scaling back on the original cast on amount by fifteen stitches (one lace repeat) in order to make it a size 1 year. I’m on to my next projects, and both are crocheted. 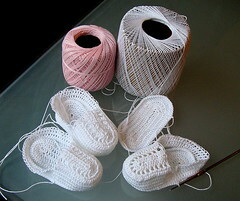 This weekend I began an order for two pairs of heirloom booties. 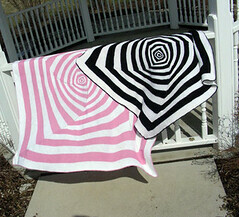 Instead of using one color, I’m making the bottoms white and the cuffs pink. The crochet hook is size 7 and this cotton is size 10. 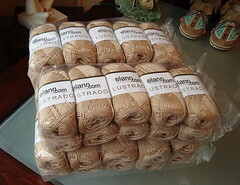 I hope to finish these by tonight – – wish me luck – – they have to be off into the mail asap. 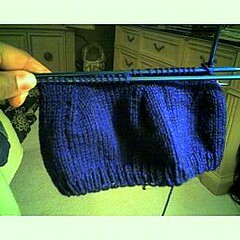 This is the progress so far on the baby hat to match the sweater with the American flag theme. I think it’s too BIG! at a 16″ circumference. Oh well, I have decided to finish it and then make the next smallest size (14″) and give the mom both hats! Today I was blog-surfing and saw this top! I can hardly contain myself with all of the great summer tops I’m finding. 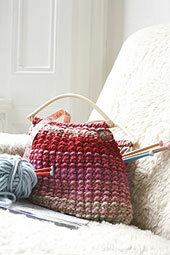 This is the “Lacy Swing Top” that appeared in Crochet Today August 2007 issue. It calls for 4 skeins of cotton using a size E hook. I am putting it on ‘my list’ and intend to make it in dark purple.